Mornington Peninsula, south and south-east of Melbourne, is bordered by Port Phillip Bay (west side), Bass Strait (south side) and Western Port Bay (east side). Its area, calculated by reference to the pre-1994 municipalities of Flinders, Frankston, Hastings and Mornington, is 791 sq km. Mornington Peninsula shire (1994) has 720 sq km. The peninsula bends in a southerly and westerly arc around Port Phillip Bay. Its extreme point, Point Nepean, forms the eastern side of the entrance to the bay, known as The Heads. There is a diverse range of land forms. The three most prominent are granitic outcrops known as Arthurs Seat (near Dromana), Mount Martha, and Mount Eliza. All were identified and named in early exploration or survey of Port Phillip Bay, from where they are best viewed. There are extensive hills behind Arthurs Seat, extending south-east to Shoreham on Western Port Bay. Between Arthurs Seat and Point Nepean there are relatively recent dunes overlain in many parts by limestone. Between Rosebud and Cape Schanck the dunes are highly undulating and known as The Cups. Cape Schanck is a basaltic headland with a lighthouse for Bass Strait shipping. Another basaltic headland is West Head, where Bass Strait enters Western Port Bay. There were also some low-lying or swampy areas: the Tootgarook swamp near Rosebud was once a tideway; the Kangerong basin north of Dromana was settled early for grazing; and the Coolart wetland near Balnarring was part of Henry Meyrick’s pastoral run (hence the place name Merricks). More extensive wetlands border Western Port Bay, north of Coolart. Mornington Peninsula was the site of the first official European settlement of Port Phillip. In an endeavour to forestall settlement by the French H.M.S Calcutta was dispatched in 1803 and unloaded its cargo of immigrants at Sorrento. The settlement, lacking permanent water, ended after about six months. After initial pastoral settlement, Mornington Peninsula was exploited for building lime and fishing. After the gold rushes of the early 1850s Melbourne’s expanding population needed buildings and lime-burning kilns dotted the peninsula from Mornington to Sorrento. The early village-ports included Mornington, Dromana and Rye. Banksia and she-oak trees were cut for the kilns (and for bakers’ ovens in Melbourne) and the exposed soil was mainly recolonised by coastal tea-tree. It in turn was also exploited for firewood. Fishing lasted longer than either lime or firewood, and there was also a fishing village at Hastings on Western Port Bay. At the extreme end of the peninsula a quarantine station was established at Point Nepean after the arrival of the fever ship, Ticonderoga with a complement of immigrants in 1852. Farm-selection settlement began during the mid-1850s. The damper hills in the middle of the peninsula were found to have good soil, suiting dairying and orcharding. Access to markets remained difficult while there were only shipping vessels to transport produce. During the 1870s and 1880s two unrelated events improved transport services. Sorrento receives cooling winds from across Port Phillip Bay and the Melbourne entrepreneur, George Coppin, established tourist facilities and improved passenger-boat services during the 1870s. During the next decade Point Nepean was fortified to guard against naval invasion, and strategic considerations drew attention to the further risk of invasion through Western Port Bay. There is a deep water channel to Hastings. In 1888-89 a railway line was constructed form Frankston to Hastings and Crib Point, passing by a military camp at Langwarrin. A branch line was also opened to Mornington. The line ran through productive orchard areas at Somerville and Tyabb. Later, in 1921, a branch line was opened through Merricks and Red Hill, also productive orchard areas. George Coppin’s Sorrento emulated Mornington as a seaside resort. Mount Eliza and Mount Martha were also resorts of well-to-do Melburnites, and numerous mansion-like holiday homes attest to their prosperity. More prosaic holiday making came with general ownership of motor cars, popularising guest houses and foreshore camping during the 1920s. Bus services transported holiday-makers and their camping gear from Frankston or Mornington to Rosebud and Rye. A guest-house and golf-course culture developed on the other side of the peninsula at Flinders shortly after 1900. The most exclusive resort, or at any rate the one with the highest-priced real estate, is found at Portsea, and it was predominantly a development after World War II. The peninsula’s population more than doubled between 1947 and 1961 to nearly 52,000 people. Frankston had half the population, and Frankston’s figure doubled again in less than ten years. Permanent residents were also added in large numbers to the bayside areas from Mornington to Sorrento during the 1960s to 1990s. In the early 1960s there was industrial development around Hastings and Crib Point. Until then the major industry had been defence at the Flinders Naval Depot/HMAS Cerberus. Within a few years a petrol refinery, liquid-petroleum-gas processing plant, a steel works, a fertiliser plant and other industries were established. Hastings shire was formed by severance from Frankston in 1960. Rising land prices made it uneconomic for small orchardists to buy larger holdings, and most moved out of the peninsula. Abandoned cool stores were put to other uses, the most notable being an antique centre at Tyabb. The choice of antiques signified a stronger move towards tourism and day trips, with calls at galleries, wineries and places to buy knick-knacks and collectibles. The postwar urbanisation of the Mornington Peninsula put considerable pressure on some of the most visually appealing areas. The advance of housing from the foothills of Arthurs Seat was stopped by the creation of a State Park. The southern coastline has the Mornington Peninsula National Park, joined to a Point Nepean reserve at the western end and a bushland reserve on an inland area (Green’s Bush) at the eastern end. Wetlands along the Western Port coastline are reserved, forming part of a unique ecosystem that occupies Western Port’s northern shoreline. Advancing postwar urbanisation can be traced by changes to the Melbourne metropolitan statistical area. 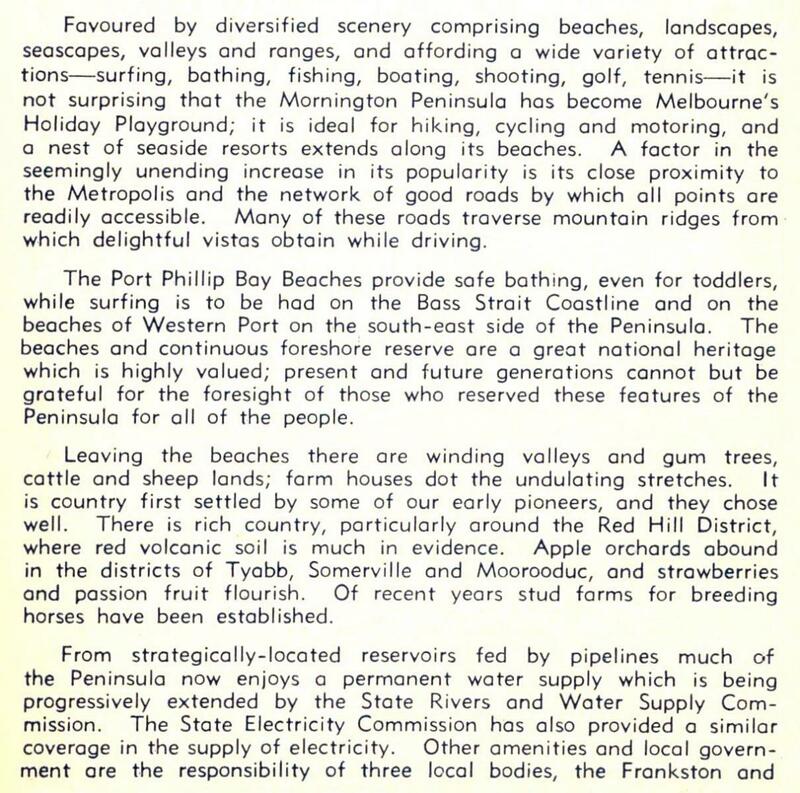 In 1954-61 it included the areas of Seaford, Frankston and Mount Eliza in the Frankston and Hastings shire. In 1966 all of the peninsula was included in the metropolitan statistical area, with the map showing a nearly continuous urban strip along Port Phillip Bay and urban areas at Hastings and Crib Point. In 1976 the bayside urban strip was thickened and continuous. In 1991 the strip was mapped in the Melbourne Social Atlas (ABS) and extended to the Rye and Portsea back beaches. Frankston city was the eleventh largest in population of the metropolitan area’s 56 municipalities. In 1994 Flinders, Hastings and Mornington shires were united as Mornington Peninsula shire. In 1996 52% of the 34,522 dwellings in the former Flinders shire were unoccupied on census night, an indication of the proportion of holiday homes. The percentages for the former Hastings and Mornington shires were 15% and 16% respectively. The shire is described in a separate entry.